Every home improvement project has an impact on your home value. Some projects, such as kitchen remodeling and bathroom remodeling, are known to be great investments. Each adds functionality to a home and each has a high return on investment here in Maryland, 72.2% and 59.6% respectively. In layman’s terms, each of these projects is a good investment, and when a homeowner sells their home they can expect to recoup $0.60-$0.72 for every dollar they spend. But what about decking? Is it a good investment? A new deck adds invaluable outdoor living space to your home. A deck adds home value. Adding a deck can make your home more visually appealing and enhance its overall curb appeal. A composite deck is also known as a low maintenance deck for one very good reason. It requires very little maintenance. If you want to increase curb appeal and living space in a single weekend then a new deck is the perfect project for you. Other projects with similar returns on investment will run you tens of thousands of dollars. A new deck is much more affordable. If you already have a deck, but it’s looking a little worse for wear, Re-Decking may be an option. It’s like a facelift for your deck. The existing frame remains in place and only the deck boards are replaced. 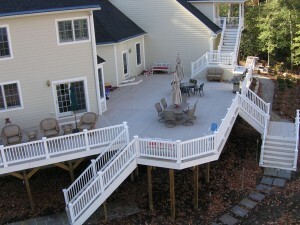 Re-decking is a cost-effective alternative to total deck replacement. If you have any questions about the Return on Investment of a New Deck in Maryland, please contact Mid Atlantic Deck & Fence (MAD Fence) today by clicking here or calling 1-800-833-9310. We proudly serve Anne Arundel, Baltimore, Howard, Montgomery and surrounding counties.